The Avalon remains a popular full-sized sedan for the space and comfort the vehicles provide. For 2019, the vehicles have a slightly new look that is no less than awe-inspiring. 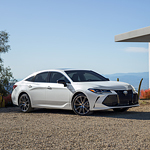 See the newest Avalon models in our Burlington showroom. Explore the options and feel free to take a test drive. The sedan is still sleek and elegant with its subtle curves, lines and aerodynamic style. However, the Touring model boasts a slightly more sporty look thanks to the black grille, side mirrors and window frames. There is no mistaking when a driver desired to make a turn thanks to the line of amber LED lights that flash in a linear fashion. The 19-inch wheels feature a combination of gloss black and satin matte aluminum finish that blends well with the rest of the body design. The Avalon also features a number of improved interior designs that must be seen in person. Take a trip to your local Liberty Toyota.